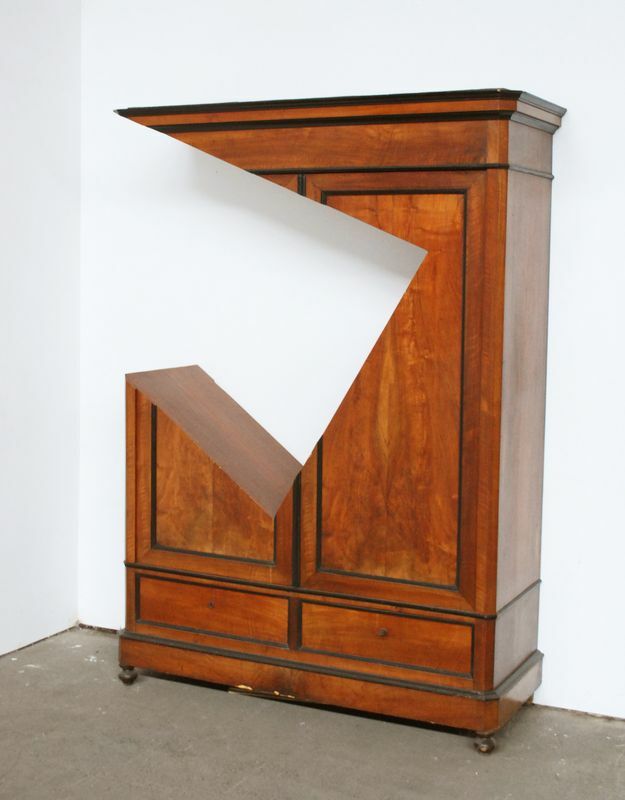 What ever was furniture that functioned in an Interior, he deconstructs to sculptures with a new plastic meaning. The massiveness of the dull wood cabinet furniture is countered by a very sharp cut from the original volume. Notions such as design and functionality are changed into a plastic engaging and autonomous form. Once placed in a space the constructive elements generate a strange dialogue with each other, the space and the viewer. In certain ways, Hannes Van Severen can be recognized as a distant heir of minimalism , among others by transforming the known functional object to to an autonomous volume in space, carried out with clear and with mechanical precision. Also in his plastic thinking he is not looking for a far-fetched complexity but rather for its own logic. However, the way in which the imagination or fantasy always takes the upper hand during the creation but also afterwards at the perception, loads the oeuvre with an absurd humor and unpredictable dynamics. By the game that Hannes Van Severen plays with existing and imaginary forms, he disrupts the familiar harmony of our living world and he creates a conflictual situation between line, form, function and space. The sculptures provoke the spectator to the launching of his imagination to create a possible logic for the object. The new dimension in which the works than function, is a mental open landscape with many features. What is announced as a pointless procedure, becomes an unsettling experience of object and space.